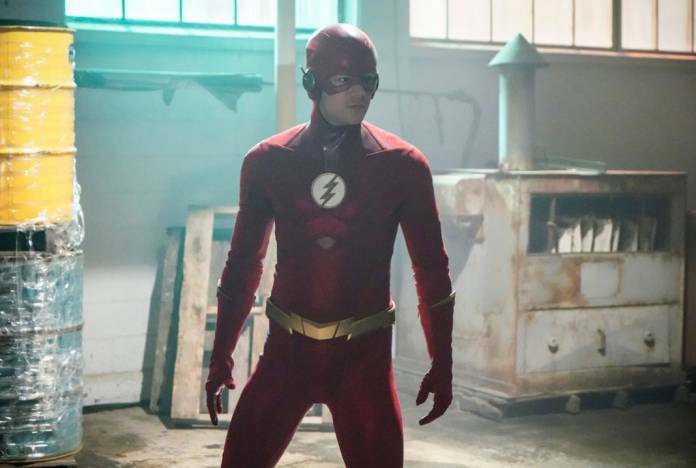 The Flash Episode 5.11 was a lesson in the complex combination of fear and rage. Orlin Dwyer/Cicada (Chris Klein) has been laying low since Team Flash discovered his identity and he is mad as hell about not being able to visit Grace in the hospital since CCPD has her under observation. It seems that he has been hiding out at Dr. Ambres’ (Lossen Chambers) house and is frustrated. Ambres, who stokes the fires of Dwyer’s rage, admonishes him to forget about visiting Grace and to get back to work ridding the world of metahumans. She has a list of known metahumans for him to track down. Dwyer/Cicada goes on a killing spree, targeting the metas on the list. Team Flash (Flash, Killer Frost, Elongated Man, and XS) is on the case and speed off to stop him. Killer Frost is able to slow Cicada down with her powers, knocking his dagger out of his hands and icing him to a wall, but the meta is injured and Nora asks for help. 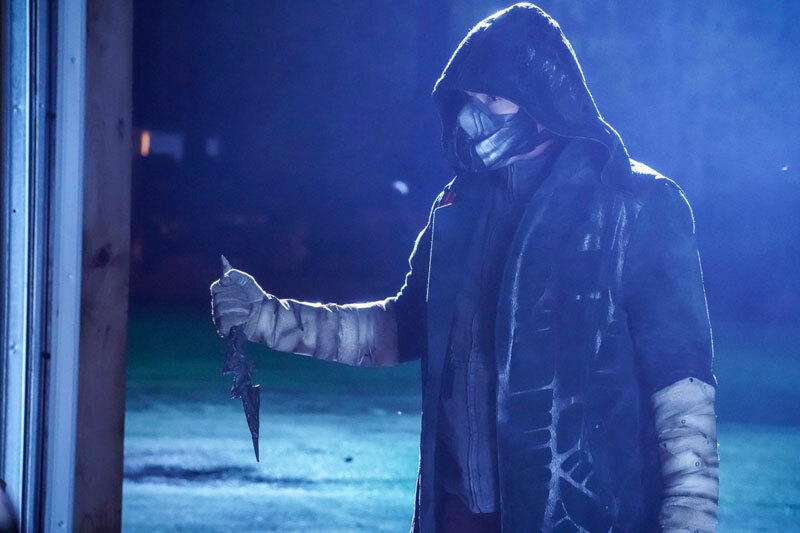 Stupidly, Barry asks for Caitlin to examine the meta and while Frost is gone, Cicada is able to break free of the ice and recover his dagger. He grabs Nora, stabs and pummels her before Barry can do anything. She falls to the ground, and once more Cicada gets away. Back at S.T.A.R. Labs, we learn that Nora has a broken back, and unfortunately her speed healing is not working thanks to Cicada’s power-dampening skills. Nora wakes up but cannot feel her legs. She is paralyzed. There’s no telling when or if she will be able to walk again. It’s a hard blow for the team, and especially hard for Barry since he helplessly witnessed Nora’s beating, fears for her recovery, and can do nothing but sit by her side, trying to be supportive. With Sherloque’s and Ralph’s deductive help, they discover that the metas that Cicada has been targeting all have police records and have recently been released from jail. They find the list that Cicada has been working from, so Cecile and Barry go to CCPD to warn Captain Singh that someone has helped Cicada get this list. Singh says he will handle it, but as they are leaving, Cecile senses the anger coming from one of the officers in the department. Cecile tells Barry that the metas on the list need to be protected from Cicada, and she will pull strings with the Feds to get them into some kind of witness protection. Barry enlists Killer Frost to help locate the metas on the list. One name that Frost recognizes is Norvok (Mark Sweatman) who was one of Amunet Black’s henchmen. 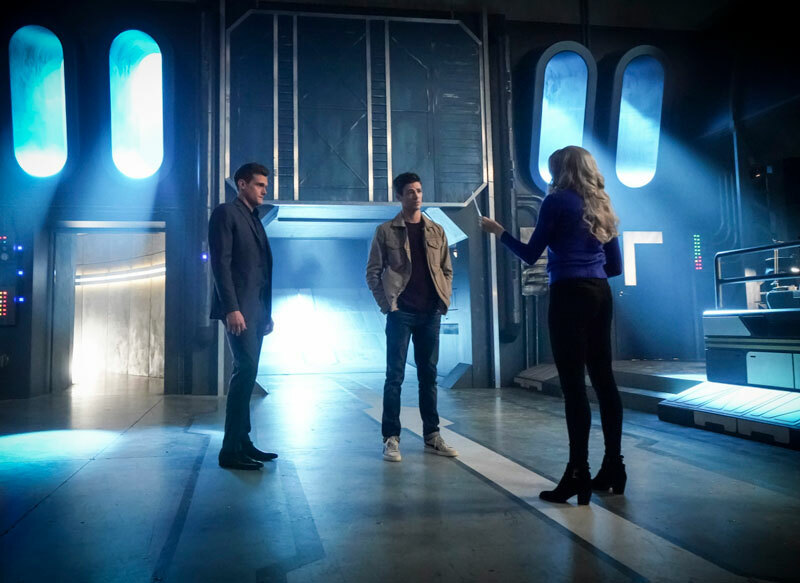 With some convincing on Barry and Frost’s part, Norvok agrees to help round up the other metas so they can all be safely transported out of Central City but only on the promise that he is first to go. Barry, Ralph, and Caitlin are able to convince everyone to accept the Feds’ help to get out of the city. As Barry is retrieving the last of the metas, Peek-A-Boo, to bring to the pickup location, Cicada shows up. Barry and Cicada begin a brutal fight but Barry stops in time to use a tachyon devise to open a breach so that he can escape with Peek-A-Boo. Now all they have to do is wait for their transport. Cecile tells Barry to calm down, and trusts that he will not go over the line and actually kill Cicada. But in sensing Barry’s anger, Cecile realizes she felt the same anger at CCPD coming from one of the officers. She now knows who provided the list to Cicada and goes back to CCPD to deal with it. The helicopter transport arrives but so does Cicada. Cicada throws his dagger at the helicopter and damages it and then turns his attention to the metas. Barry tells Ralph to take the metas outside and get them into the helicopter since it can no longer land. Killer Frost creates a dagger of her own out of ice and fights with Cicada, drawing blood. Cicada uses his dagger to knock Frost out and then throws his dagger through the back wall toward the escaping metas, just missing the last remaining meta, Novok, who Ralph is hauling into the helicopter. As the dagger flies back to Cicada, Frost uses her icy powers to neutralize it, allowing Barry to use his powers to fight Cicada. The fight is epic. Here we have two people fueled by thoughts of revenge and fear and hatred battling each other, and we see that Barry is fighting harder than he’s ever fought before. Iris is monitoring the fight from the lab and realizes that something is wrong with Barry’s suit. It’s not the suit that’s the problem, it’s Barry. He is using so much power against Cicada, he is on the verge of killing him. Nora, who has by now regained her legs and her powers, speeds to the scene to stop Barry just in time. When Barry sees Nora, he stops and once again, Cicada is able to retrieve his dagger from the ice and escape. Back at CCPD, Cecile and Captain Singh confront the cop who had passed on the meta information to Cicada. They found evidence on his computer at CCPD and on his home computer. Cecile learns that this is the same officer who was controlled by Spencer Young in this season’s News Flash. He was motivated by fear and hatred of metas since Spencer used her meta-tech to control him. Cecile also senses he will try to escape and is prevented from doing so by other officers of the CCPD. Captain Singh later remarks to Cecile that her knowing that the officer would try to escape was almost as if she were reading his mind. This was awkward, and I was a little disappointed in Cecile’s flustered response. As a D.A., I thought she would be better able to think fast for an appropriate response. Singh commented that he couldn’t wait for Joe to get back because together, he and Cecile will be a force to be reckoned with. Cecile assured him that they are. I just hope this is not a set-up for the opposite: that there will be a strain between them when Joe returns. As promised to Cisco, Caitlin is continuing to work on the cure for metahumans. This sparks a contest of wills between Caitlin and Frost, who does not want a cure to be found. It’s not just that Frost does not want to be cured out of existence, but because Frost wants to be around to protect Caitlin. 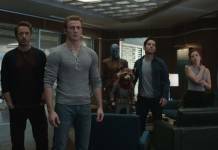 Ralph points out to Frost that after Devoe supposedly killed off the frosty part of Caitlin in season 4, all Caitlin wanted to do was get her back. She thought part of her was missing. Caitlin would never try to get rid of her. At the end of the episode Caitlin and Frost were able to talk it out (they’ve come a long way from leaving each other notes) and come to an agreement. Caitlin will continue working on a cure but promises to never use it herself. And to make amends for her attempts to thwart Caitlin, Frost gives her a ball of ice that has some of Cicada’s blood in it. This meta DNA may be just what Caitlin needs to find the meta cure. Also, Sherloque (Tom Cavanagh) is continuing his investigation into Nora. 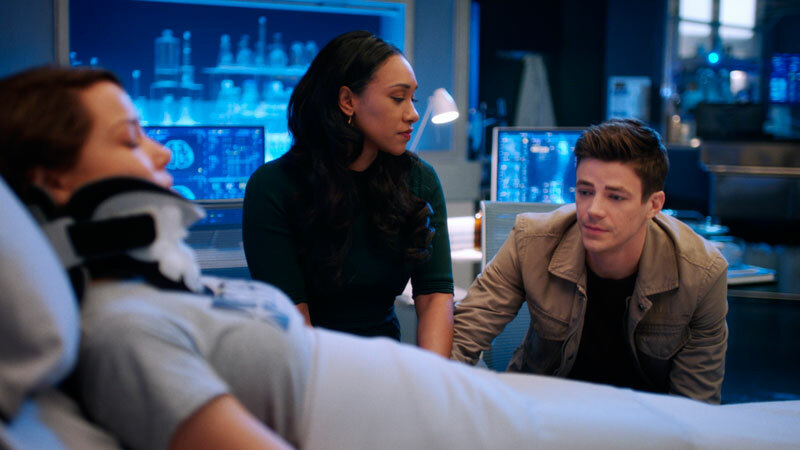 While she was incapacitated, Sherloque approaches Nora about going to the future to see The Flash Museum himself, but Iris catches him interrogating Nora. Iris goes into protective mama bear mode, and tells him that he needs to take another path to solving his mystery and to back off. Good parenting on Iris’s part although maybe misguided. I have to say that in the last couple of episodes, Sherloque is growing on me. Especially this week, in an episode that is all based on the emotions of fear and rage, it was nice to have Sherloque’s logic, reason, and powers of deduction pursuing a path that everyone else at S.T.A.R. Labs cannot see – if Nora’s powers were dampened by Iris in the future, how did she learn to use them to get to the past, and what is it that she is writing in her coded journal? I am beginning to see traces of the character’s namesake there and I like it. Ralph (Hartley Sawyer) is back! I missed him and love seeing him work with Sherloque. He is becoming the hero who helps people out in quiet ways, whether its stretching his body to lead meta’s to safety, using his detective skills with Sherloque, or just being a sounding board to work through personal issues, like he did this episode with Caitlin and Frost. He has come a long, long way. Similar to themes in this season’s Supergirl, the concept of people hating others out of fear is telling. All metahumans are being singled out for the societal ills of the ‘normal’ people — stoking fear, rage, and prejudice. While The Flash theme is not as overt as that on Supergirl, it is still a conversation starter and something to think about in today’s real world. Next week will bring us one result of Barry experiencing the amount of anger he felt toward Cicada. He realizes that the anger came from being a parent and the overwhelming love he feels for Nora. Since Cicada is a parent to Grace, maybe the key to catching Cicada will be to appeal to his heart and find a way to cure Grace. This could go very wrong. I don’t trust Dr. Ambres and suspect that she is using Grace to leverage Cicada into more meta killings. Tell us what you thought of the episode in the comments below. You can watch a preview for the next episode, titled “Memorabilia,” using the player below.